Hi Tampa Bay, Alex here to start off your week with some event news. 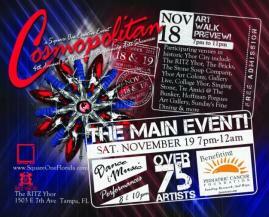 Square One&apos;s 4th Annual Fall Creative Event, COSMOPOLITAN, will be taking place at The RITZ Ybor on November 18 & 19, 2011. Square One will host an Art Walk preview at The RITZ Ybor and multiple Ybor City-based venues including: The Bricks, Ybor Art Colony, The Stone Soup Company, Gallery Live, Collage Ybor, Singing Stone, Tre Amici @ The Bunker, Hoffman Porgues Gallery and Sunday’s Fine Dining. More than 75 local artists will be on display at The RITZ Ybor and some participating venues will be debuting new art shows and exhibits. Square One will present COSMOPOLITAN. The RITZ Ybor will be home to the art, music, dance and fashion extravaganza that is going to feature 75 local artists and live performances from over 40 musicians, dancers, models and performers. The theme of COSMOPOLITAN revolves around a traveling, around-the-world, international theme. Audiences will be encouraged to incorporate the theme and colors into their attire. Please wear red, white and blue at the event. Also, artists and performers are encouraged to present their work based on the chosen theme which involves specific concepts, colors and subject matter. Admission: On Friday, the Art Walk preview is FREE. On Saturday, there will be a suggested $5 donation at the door. This event is open to the general public of all ages. * A portion of those donations benefiting the Pediatric Cancer Fund (PCF). Reserved seating and VIP tables for the 8- 10p.m. stage show performances are available by e-mailing rsvp@squareoneflorida.com. Have a great Monday and check back with us throughout the week for updates on Things To Do In Tampa Bay and on Tampa Bay Events.